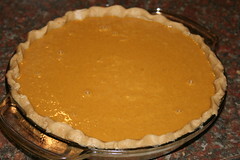 What better filling for an okara pie crust than a pumpkin-okara pie? This recipe is based on the one from The New Farm Vegetarian Cookbook. I incorporated okara into the mix and made a couple of other minor changes. Note: A sweeter version of this recipe can be obtained here. Bake for 10 minutes at 425 degrees Fahrenheit, and then reduce heat to 350 degrees Fahrenheit and bake for an additional 45 minutes. 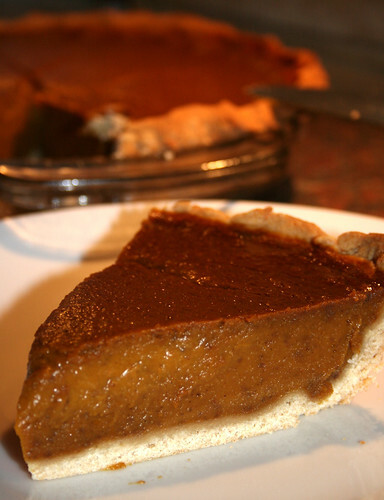 Allow pie to cool on a rack before eating. 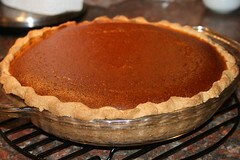 Verdict: The other resident of this house proclaims this pie to be "perfect"; however, I thought it wasn't sweet enough. Next time I think I will add sugar or maple syrup in addition to the agave nectar. I also think that okara can be used to offset some of the soy milk, and that it wouldn't affect taste or texture. So my goal for next time is: more sugar, more okara.